There is some evidence through trials earlier performed in NSW that phosphorus (P) rates can be reduced the earlier the crop is sown. Agronomy Solutions recognises the value the right P rate can make in certain broadacre cropping locations. In order to get some baseline information in this area, we ran glasshouse trials funded by the South Australian Grain Industry Trust (SAGIT project AS216) on P requirements and crop responses. In 2017, field trials were started to find the economics behind optimum P rates with varying climate conditions and different times of sowing. Three field sites are being monitored over the next two years on the Yorke Peninsula and western Mid-North where country is notoriously lacking in P availability. Research is being conducted across three times of sowing in late April, mid-May and early June with Mace and Trojan wheat varieties. 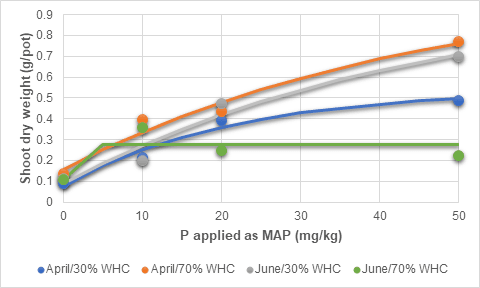 Five rates of P per hectare (as MAP) are being tested in order to find the optimal P rate and corresponding yield responses. Agronomy Solutions will drive industry education to create awareness of these results as it is already clear P replacement rates need to be increased in these areas as reduced P efficiency caused by fixation are higher than most allow. 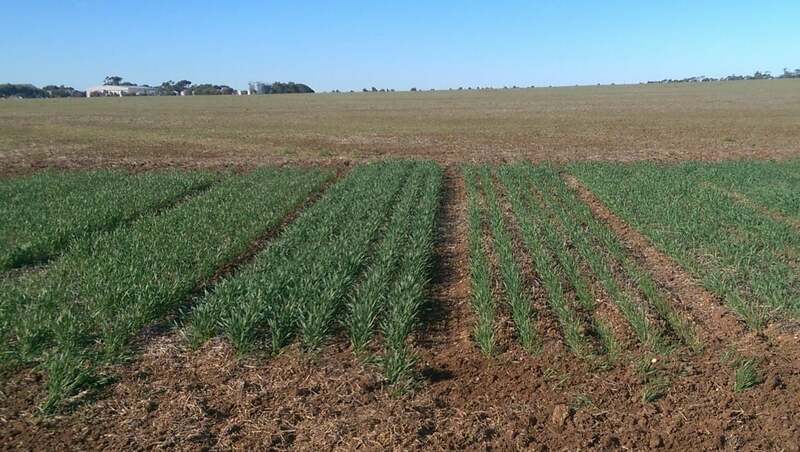 Wheat dry matter yields (GS30) obtained at each P treatment applied in two contrasting soil moistures in climate conditions simulating April and June sowing using a soil type from Kangaroo Island – Glasshouse experiment. Wheat (Trojan) response to applied Phosphorus at a trial site near Arthurton. This bay was sown on the 28th of April. Corresponding responses will be assessed at two later sowing times. Field trial results are currently being collated to allow for statistical analysis and are awaiting harvest to obtain grain yields from each treatment. An interim report on the glasshouse results is being prepared for submission to SAGIT.